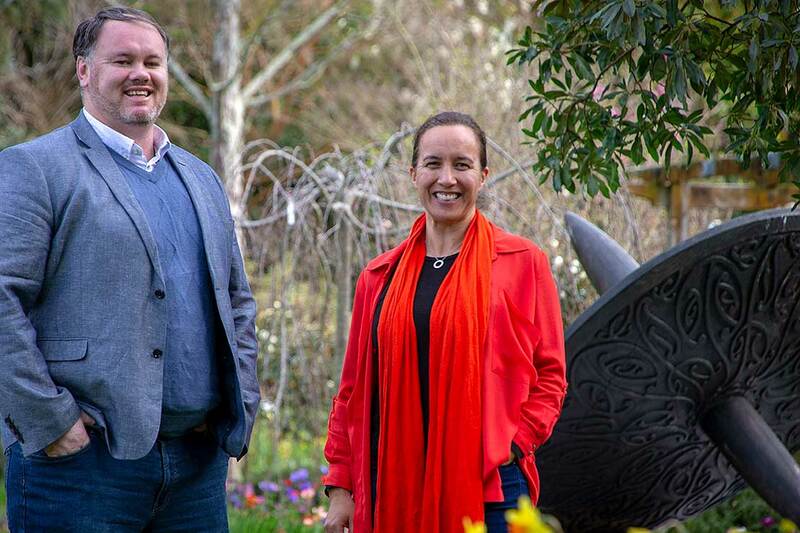 Jeremy Hapeta and Dr Farah Palmer have been awarded $250,000 to explore the use of traditions, knowledge and treasures handed down by ancestors in rugby. Now, Dr Farah Palmer from the Massey Business School and Jeremy Hapeta from the School of Sport, Exercise and Nutrition are part of a research team exploring the use of traditions, knowledge and treasures handed down by ancestors in rugby. Ngā Pae o te Māramatanga has awarded the team $250,000 for the study. Resilient legacies: Manawa te taonga tuku iho: The application and influence of taonga tuku iho in rugby, aims to explore how the mana and mauri ora of taonga tuku iho are considered, applied and commodified in rugby. This study will bring together researchers and practitioners from different disciplines, (business health, psychology, art and design), and areas of expertise, (rugby, toi Māori, mātauranga Māori and technology), to share diverse knowledge systems, experiences and expertise. Dr Palmer, one of the study’s principal investigators, hopes the study will create more nuanced and robust considerations of how the incorporation of taonga tuku iho in rugby impacts on the mauri ora of Māori people and knowledge, as well as on rugby stakeholders and New Zealand society generally. “The outcomes will contribute to understanding how mātauranga and tikanga Māori could be applied in sporting contexts through policies and practices. Learnings with regards to intellectual property rights, indigenous branding and indigenous wellbeing and prosperity may also be discussed,” she says. “This research will assist sport organisations, like New Zealand Rugby and the New Zealand Olympic Committee, in developing policies and practices regarding how taonga tuku iho are used and protected in events, teams, and marketing contexts. Māori who gift these taonga can also consider what implications this has for the wellbeing of themselves, their whānau, hapū and iwi,” Dr Palmer says. Physical education lecturer, and one of the study’s associate investigators, Mr Hapeta says the most widely-known ritual rugby has adopted is the pre-match haka which, historically, has been ‘Ka Mate’, composed by Ngāti Toa Chief, Te Rauparaha. “Recently, however, other symbols and cultural artefacts are being introduced into New Zealand rugby rituals,” he says. “Take the mere for example – when players achieve 100 caps in Super Rugby, they are presented with this taonga [pounamu]. Also, during the 2017 British and Irish Lions’ series, carved taiaha were presented to the winning teams of non-test matches,” he says. “It is becoming a tradition to bestow taonga upon honoured guests, such as the Lions’ Tour captain Sam Warburton receiving a korowai [cloak] and hongi from All Black Dane Coles. On a superficial level people may perceive these tangible taonga as ‘just things’, but at a deeper-level of meaning, the act of presenting taonga speaks intangible volumes about valuing traditional Māori knowledge. We want to conduct research that explores attitudes and perspectives at this interface,” he says. The 11-strong team also includes Dr Carwyn Jones, (Victoria University), Dr Mohi Rua, (University of Waikato), Professor Te Kani Kingi, (Te Wānanga o Awanuiārangi) as principal and associate investigators respectively and advisors, Professor Meihana Durie, (Massey University), Dr Jason Mika, (Massey University), Dr Carl Bradley (previously Research Officer for Te Au Rangahau), Tamahou Temara, (Toi Māori), Luke Crawford, (Kaumatua and Cultural Advisor, New Zealand Rugby) and Malcolm Mulholland, (Massey University PhD student, Te Wānanga o Awanuiārangi).